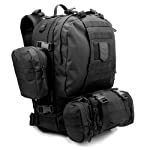 6 So what do we recommend for the best molle backpack? A great tactical bag is not for simple use because it would be serving you in the harshest weather and the toughest terrains. Thus, the first thing you need to look into is its resilience and ability to withstand the demands of the outdoor conditions. Outdoor backpackers and military in combat know exactly the importance of a durable bag that could last when the going gets tough. NPUSA Tactical Molle Bag. The material used for this backpack/daypack/bag is 600- denier polyester with PVC lined features to ensure durable and daily use. It’s a sturdy and well-made bag with a lifetime limited warranty so you don’t have to worry as long as your warranty still takes effect. Exos Bravo Molle Backpack. There are lots of durability features in this backpack from its outer shell material that is constructed from 600-denier polyester. The bag also has load-bearing seams that provide additional reinforcement to its overall construction. The strap connection points make this backpack carry the load without tearing or snapping. No warranty is indicated in the manufacturer’s site. 3V Gear Paratus Tactical Backpack. The 600-denie nylon material with PVC backing contributes to the weather resistance and ruggedness of this tactical molle backpack from 3V Gear. Other features that add to its heavy-duty resilience include the self-healing coil zippers designed with the para-cord pulls. The seams are double stitched and it also comes with a heavy-duty drag and carry handle. This backpack comes with a lifetime warranty. The design of the tactical molle backpack goes beyond the aesthetics and what the unit looks like. The best option for design should combine both the looks and the practicality of that feature in the overall performance of the bag. Exos Bravo Molle Backpack. The backpack focuses on functionality and quality but the overall design of this bag is also impressive. There are also many colors to choose from including bag, olive drab, coyote tan, grey, and grey/black. Several commendations applaud the flawless design of the backpack from the materials to the positioning of the hydration pocket and straps. 3V Gear Paratus Tactical Backpack. The unique versatile modular design of this unit allows you to have easy access through a 3-in-1 pack. The multiple pouches could be customized spaces for your medical bag, mug, and other devices or gadgets. There’s also a large pocket designed for the hydration bladder and a good body positioning so that it remains comfortable and snug. NPUSA Tactical Molle Bag. This tactical Molle bag is designed for comfort and practical function to mention that there are numerous color variations to choose from. Available bag palettes include digital camo brown, black, multi cam, tan, olive green, pink, and a variation of neutral tones. The shoulder sling-strap features strap-loops is practical as you can put your pens or sunglasses into it while the dual tube ports in camel back position makes the bag versatile and easily accessible. Price is a relative yet important factor to consider when it comes to the best molle backpack on the market. It’s imperative to find an affordable yet high-quality backpack and in the tactical molle bag niche, it is quite challenging to achieve. NPUSA Tactical Molle Bag. This model is the most affordable in our price scale and prices could still vary depending on the retailer you purchase it from. With an affordable price, the unit is also fully loaded with innovative design and quality for performance. Exos Bravo Molle Backpack. 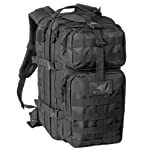 The tactical molle backpack is a mid-range unit with some of the best features including its organizational pockets with zipped and corded designs. 3V Gear Paratus Tactical Backpack. With a much costlier price, the 3V Gear backpack gives you your money’s worth with all its innovative designs. It’s a durable and heavy-duty backpack so you definitely get what you paid for or even more. How much can your backpack carry? Tactical and outdoor backpacks are made with generous storage capacity to essentially handle and carry all your essentials for several days and longer. They should be able to carry a heavy load without snapping. Exos Bravo Molle Backpack. With a capacity to carry up to 34L per active standard, this backpack is designed to carry and secure gears and large tools. The multiple pockets and compartments are also dedicated for smaller objects and components. 3V Gear Paratus Tactical Backpack. The heavy-duty backpack has a carrying capacity that allows you to take necessary items for a 72-hour adventure. The bug-out bag has an overall size of 2890 cubic inches, making it a generous storage and carrier unit for long stays in the outdoors. NPUSA Tactical Molle Bag. This bag is the smallest in our top 3 brood of molle backpacks although the water bladder can fit up to 2 liters of liquid through the pass through hole. So what do we recommend for the best molle backpack? How much stuff do you need to carry for how long? What’s the ideal backpack designed for your kind of lifestyle or backpacking needs? Is a high-end backpack within your budget or not? Update your outdoor and tactical gears with the best molle backpack and discover more details through other molle backpack reviews. You can also check out other essentials including sks stocks for the money, red dot magnifier, and laser for ar 15.